The crew over at Swedroid posted one of the first ever live videos of Android 4.2 running on the LG Nexus 4, this morning. In the video, we get to see the new Quick Settings menu that was hinted at a couple of weeks ago in a leaked 4.2 build. We were initially under the impression that a second swipe down from the notification menu would trigger this menu, however, you can see in the video that a tap on a new icon for the menu is all that is needed. It’s pretty slick. In the actual menu, you can see brightness, data, WiFi, battery, Airplane mode, Bluetooth, and settings toggles/shortcuts. More importantly though, you can see a big button in the top left for the current user, which means multi-user support is coming to both phones and tablets in 4.2. We can also see some of the new UI tweaks that Google has made in 4.2. First, the camera icon is all new and very pretty. Second, the stock Android clock is no longer a series of dots, and is instead a fully encompassed minimalist circle. Also, is that a 5th column of icons in the app drawer? What else are you noticing? 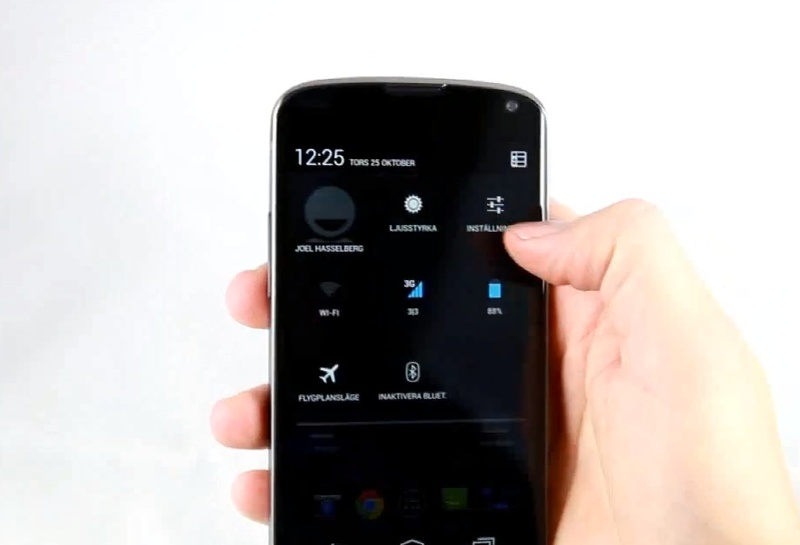 And how great does the Nexus 4 look?